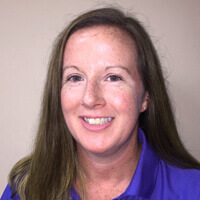 Carrie DePerro brings with her 15 years of physical therapy experience treating persons of all ages in Philadelphia and the surrounding suburbs. A graduate of the University of the Sciences in Philadelphia, Carrie’s entire career has focused on orthopedics- helping relieve people with spinal and joint pains and helping them return to everyday activities without restriction. More recently, Carrie has expanded her scope of practice by becoming a certified Vestibular Specialist. She now also treats clients with a variety of imbalance-related diagnoses, including post-concussion syndrome, positional vertigo, and the various diagnoses associated with frequent falls. Outside of work, Carrie enjoys barbecuing with friends and family. She also is an avid sports fan—rooting for Philadelphia’s favorite teams!